During the storms of 10/11 January, two fishing vessels sank in the Irish Sea with the loss of seven lives. All five seamen on the Pere Charles, from Dunmore East, Co. Waterford, and two from the Honeydew II, of Kinsale, Co. Cork, were drowned. The disaster shocked Ireland and had a further impact for the bluegrass community - Dunmore East has been the welcoming venue of the annual Guinness International Bluegrass Festival since 1995. In addition to local fishermen, one of the dead seamen was from Poland, and one from the Ukraine. The Dunmore East Trawler Tragedy Appeal has now opened, with an account at the Allied Irish Bank, Ardkeen, Co. Waterford (sort code 93-44-02; account number 12200048). Contacts are: Fr Brian Power, Killea PP, Killea, Dunmore East; Joefy Murphy, lifeboat coxwain; Ciaran O'Mullain. As well as presenting many bands from Ireland, the UK, and the USA, Dunmore East was the first Irish bluegrass festival to book bands from continental Europe, including the Blue Grass Boogiemen (NL), 4 Wheel Drive (NL), Fox Tower Bluegrass Band (D), Vabank Unit (CZ), New Section (CZ), Jack Danielle's String Band (F), and Blue Railroad Train (F). The Sons of Navarone begin a busy February with a concert at 't Smiske, Gemeenteplein 7, 1730 Asse, Belgium, on Friday 2 February at 9.00 p.m. On Saturday 10 February they'll be playing at 'd Oude School, Damstraat 49, Weerde (Mechelen), Belgium. Later in the month they play a short, intense tour of southern and midland England (21-3 February), with shows at the Nettlebed Bluegrass Club, Oxfordshire; the Windmill Acoustic Music Club, Ewshot, Surrey; and the Heart of England Bluegrass Club, Kenilworth, Warwickshire. For full details, see the Sons' website, which can also be reached through the Bluegrass in Belgium website. Cybergrass carries the news that Eric Uglum, formerly of Lost Highway, will join Chris Stuart & Backcountry as a full-time member on lead guitar and mandolin. Eric's two stepsons, Christian Ward (fiddle) and Austin Ward (bass), are already Backcountry members. More details of the band and of The old road to Jerusalem, the latest album on the Backcountry label by Eric, Austin, and Christian, can be found here. Lost Highway and Backcountry are both well known on this side of the Atlantic from their tours in Europe. Chris Stuart (guitar, lead vocals) and Janet Beazley (banjo, vocals) will be teaching songwriting and bluegrass banjo respectively at Sore Fingers Week 2007 (9-14 April). A.R.T. Promotions is arranging a Backcountry tour of Europe between 9 and 24 November 2007. 2) The absolute DEADLINE for reservations/deposits is Monday, 26 February 2007. I am going as an unofficial guide and assisting my travel agent sister, who has booked this tour as a bluegrass fan, at cost. She has arranged this not-for-profit tour partly as promotion for future trips through her travel agency, but also because of her love of the music. 1) To promote international bluegrass, primarily through the EWOB events in this case. 2) To offer bluegrass fans in North America a chance to take this trip at a much lower expense than one could ever arrange on their own. For details of the First-Ever European World of Bluegrass Group Tour (May 2007) and also of the IBMA 'Fan Fest' Bluegrass Road Trip (October 2007), see here. Bluegrass Music Denmark announces a series of concerts at the Karens Minde Kulturhus, Wagnersvej 19, 2450 Kbh. SV, Copenhagen. Friday 26 January, 9.00 p.m.: High on Grass (Sweden) plays traditional bluegrass with tight three-part harmony, and consists of Lars-Åke Hedman (banjo; tenor and lead vocals), Ulf Hedman (bass), Lennart Martinsson (guitar; lead and baritone vocals), Rune Kjäll (fiddle; baritone and lead vocals), and Bengt Adielsson, who joined the band in 1996 (mandolin, dobro; all vocal parts). In 2004, to celebrate ten years as a band, High on Grass released a CD, Unleashed. Friday 16 February: Double concert - Big Hungry Joe and Græshopperne. Twenty below zero, the new CD by the Clayhill Brothers band from Finland, has just been released on Bluelight Records (BLR 33137-2) and will be soon available through Fennica Records (advance orders can be made via this link) or through CDon.com. Contact the band by e-mail or by post: The Clayhill Brothers, P.O. Box 288, FI - 00101, Helsinki, Finland. Check the band out on the Finnish Bluegrass Music Association website. Their own website is opening soon. Thinking it blue! (Tortellino CD 001), the new CD by Bononia Grass from Bologna, Italy, is available for tracks to listen to and buy on CD Baby - the link to it is here. Bononia Grass came third in the European Bluegrass Band of the Year awards at the EBMA's European World of Bluegrass EWOB Festival 2006. The second Coastline Bluegrass Music Event will be held on 8-10 June 2007 in a new venue - Plas Uchaf Farm, on the B5381, 1.5 miles (2.4 km) from Junction 19 (for Llandudno) on the A55 through north Wales. The concert schedule includes A Band Like Alice, Roots and Galoots, Thunderbridge, and the Feet First Appalachian Cloggers, together with Open Mike sessions, jams, and workshops at beginner and intermediate level. Food, bar, and camping will be available on site. B&B or hotel accommodation should be booked early, as this area is very popular with visitors. An adult weekend ticket is £36 with camping, £32 without; if you book before 1 May, both cost £4 less. Under 16s are admitted free. Book online at the website or by post to C.B.M.E., 7 Castle Place, Abergele, CONWY LL 22 7SS, Wales. International Bluegrass's 'Video file' column also notes that new and reissued instructional DVDs from Homespun includes New directions in flatpicking - from bluegrass to European dance, by Beppe Gambetta. In honour of the upcoming celebration of ten years of the European World of Bluegrass (EWOB) events, its highlight being the EWOB Festival 2007 in Voorthuizen, the Netherlands (17-19 May), the committee would like to invite anyone who has attended in the past to send information to be considered for publication in a special Tenth Anniversary program. We are seeking all kinds of material: photos, newspaper articles, funny anecdotes, your personal experiences, your favourite band(s), your favourite song or tune, what were your band's experiences at various EWOB events, etc. In short – feel free to send anything you care to share with bluegrass fans everywhere. Maybe you will see your contribution in the special 'Tenth Anniversary Edition' paper to be distributed during EWOB 2007. Please note: Materials cannot be returned. Clear, clean copies and/or scans of photos/articles, etc. are acceptable. Thank you all in advance for your support. For US readers: Come experience the 10th anniversary EWOB events in person! 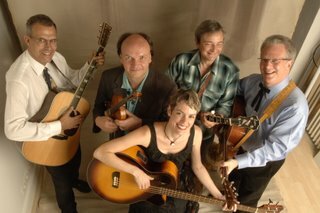 Be part of the first ever European World of Bluegrass Group Tour in May 2007. See here for details. The Wilders will be appearing in Germany, Switzerland, Belgium, and the Netherlands during the EWOB period this year, thanks to Rainer Zellner's Music Contact agency. This is their first trip to central Europe, and the shows includes the Buhl, Willisau, and Zuidlaren festivals. Details of the tour (3 May-28 May 2007) were published a month ago on the Music Contact website. Since then, two further dates have been added - the band is provisionally booked for the Karl May festival at Radebeul on 19 and 20 May (TBC). Music Contact says 'Bluegrass meets Rock 'n' Roll'; we suggest 'Old-Time meets Honky-Tonk'. Under any label, the Wilders are a high-energy band with a growing reputation, who scored a great success at the Appalachian and Bluegrass Festival at Omagh, Northern Ireland, in September 2006. The Tomáš Peško Band CD is an unique solo project from the well known banjo player Tomáš Peško, from Slovakia. All the tracks are original instrumentals, written by himself, with the features of bluegrass, swing, and jazz. The band consists also of the renowned mandolin player Michal Barok (well known also from the bands Meantime and WaterFlow), guitar player Vladimir Cik, bass player Andrej Jeriga, and - as recording and performing guest artists - dobro player Peter Szabados, guitar player Peter Balaz, and the excellent fiddler Stano Paluch. The band also had a couple of successful performances (2001, 2003) at the EBMA's EWOB Festival. In 2006 the CD, recorded five years ago, was released with the title Light in the storm and so far has been very well reviewed, with only positive reactions. Also thanks to the reactions of the public, musicians, and promoters, Tomáš Peško started to reform the band and compose new songs. The band is planning to perform at Bluegrass Fest 2007 in Bratislava, and at more festivals, including events abroad. Light in the storm can be ordered for 10 EUR (+ delivery costs). For ordering or any questions, please contact us here. While the band website is under construction, you can find up-to-date information about the band here. Bluegrass Time plays traditional bluegrass music in their own unique modern style, their own songs with Slovak lyrics, and of course a couple of instrumentals. The current band, founded in autumn 2004, is a continuation of the original Bluegrass Time from the late 1990s, led by mandolin player Dušan 'Titi' Bachratý, a bluegrass legend in Slovakia. Today, Bluegrass Time includes only one of the original members: banjo player, composer, and songwriter Tomáš Peško. Lead vocal, guitar, and some lyrics and music belong to Pavol Stefek; dobro and vocals to Roman Ziatko; mandolin is played by Ernest Krammer; and double bass is in the hands of Jozef Jagersky. In November 2006 Bluegrass Time released their debut CD, Kvapky rosy, which was recorded by Peter Szabados (Studio SABIK Medvedov), a great Slovak dobro player. The CD can be ordered for 10 EUR (+ delivery costs). For ordering or any questions, please contact us here. You can find more information about the band at the Bluegrass Time website and also here. We hope you all made it safely into the new year to see many bluegrass events ... and read lots of bluegrass news on our Blog! If you have news items to be published on our European Bluegrass Blog, you can send these to Richard Hawkins directly. Thank you for your interest in and support of bluegrass music in Europe!